Irrespective of what the essence of this Holy month is, our entertainment industry has started using it as a source of making good money and increasing their TRPs (no matter how they do that). This Ramadan many channels aired non-stop transmissions including prize winning shows such as ARY Digital with Jeeto Ramadan, Express Entertainment with Ramadan Pakistan, A-Plus with khushi hai Ramadan and Hum TV with Jashn e Ramadan. All these gift transmission shows were hosted by renowned anchors/actors which greatly effected the fan following of the show. The graph shows the Average Rating Points of the two shows in different cities of Pakistan. In the start of Ramadan, the ratings of these two shows indicated that Dr. Amir Liaquat was in the lead with an average TRP of 3.9 against the average TRP of 2.8 for Jeeto Pakistan. However within a few days, the ratings changed as the audience had time to evaluate the shows’ content and quality. Halfway through the holy month, the average TRP for Express entertainment went down to less than that of ARY Digital’s Jeeto Pakistan. The urban areas of Pakistan had a rating of 1.1 which is 0.1 less than that of ARY Digital, it seems the audience is equally distributed to both the shows with a minor difference. 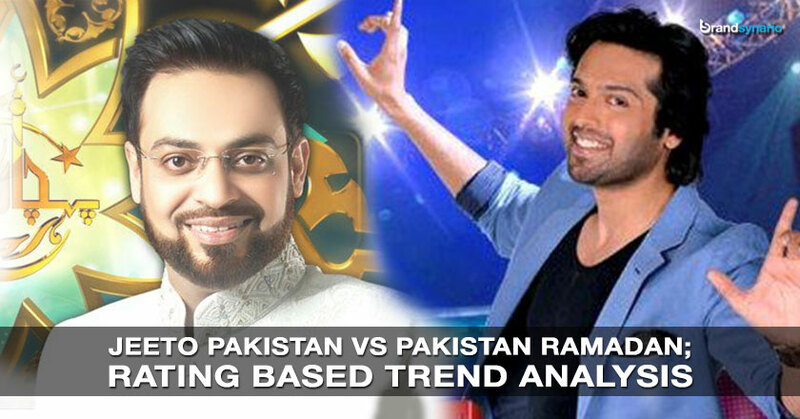 Among the big cities of Pakistan, Islamabad clearly shows more liking and spectatorship for Jeeto Pakistan with 0.9 TRP followed by 1.4 TRP for Pakistan Ramadan.In Karachi there is minute difference but Dr. Amir Liaquat takes the lead by 0.2; and in Lahore the spectatorship is almost equal for both the shows with a difference of 0.1. These ratings from different locations signify the changing trend all over the month where there was a considerable difference between the viewership of the shows to almost equal ratings now. In addition to the competition between these two, another contender – A-Plus entered capturing the audience from Dr. Amir Liaquat’s 18 hour long transmission. Talking about the audience profile, it was seen that the audience on Jeeto Pakistan was more literate than that on Express Entertainment as the questions asked, the games played and the content of that show somehow made sense and was focused SEC B and C.
Although no alignment with the holy month of Ramadan was visible in both the shows but the prize winning content strategy and countless gifts derived the whole audience and resulted in high ratings.Similarly, for Dr. Aamir Liaquat asking questions and doing somewhat weird tasks randomly so that he may distribute the gifts given by the sponsors got a lot of applause and appreciation from SEC C and D. On the other hand, he was gravely criticized by the literate section of the masses on social media that affected his show’s ratings.The real charm of the show was found among people coming from interior areas who were interested in making easy money and were equally fascinated by such ambiences and such lavish distribution of gifts. The saddest part witnessed in these transmission was the fact that the audience was on purpose made greedy and was convinced that its alright to get humiliated in front of crowds just to earn gifts. To sum up, the ratings clearly reflected that the audience votes was with Jeeto Pakistan and its host Fahad Mustafa. His sudden popularity also ended Amir Liaquat’s long time highest rating records.